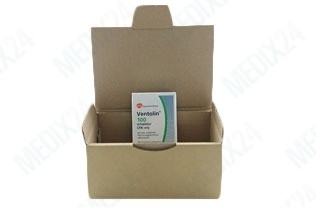 Ventolin contains salbutamol, which belongs to a goup of medicines called bronchodilators. This medicine helps to keep the airways in your lungs to stay open and also helps to relieve coughing. Effect: airways in lungs stay open. Relieve chest tighness and coughing. How to use: there is a different usage for relieving, preventing and regular treatment. 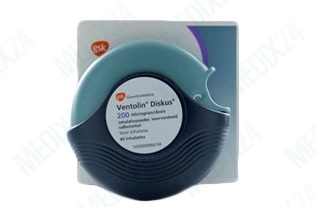 Ventolin contains the active ingredients salbutamol which is very effective and works very quickly. Ventolin stimulates the beta receptors in the lungs and airways, thereby ensuring that the whole area is relaxed again under the influence of Ventolin. Then you can breathe easier again and the other symptoms of an asthma attack will also cease or be alleviated, such as cough and sore throat. Ventolin works for about 4 hours. 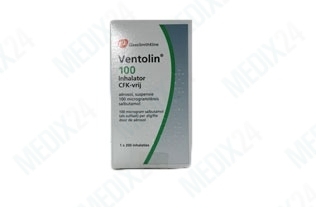 Take one or two doses of Ventolin just before or during an acute asthma attack. The Ventolin will then begin to work immediately and will make it noticeably easier to breathe. Whether you take Ventolin to prevent an attack of asthma or use it as an emergency medication during asthma attacks, the dosage and how often you should take Ventolin, is to be determined by the doctor. You should not simply stop the use of Ventolin when you think your condition has improved, but consult a doctor for advice. Should the asthma worsen while you use Ventolin, you should inform a doctor immediately. Warning: Ventolin influences the responsiveness and the ability to drive.